For 60 years, Nussbaum Equipment has been serving the towing equipment industry with pride. Founder Eric Nussbaum started the business selling towing accessories out of the trunk of his car. His dedication to quality equipment and customer service helped to make Nussbaum Equipment one of the largest Jerr-Dan Towing Equipment Dealers in the country. Eric Nussbaum was so dedicated to the company he built that he continued to work 5 days a week until his death in 1999 at age 93. Over the years we've never lost those original ideals - that quality equipment and customer service are the keys to success. 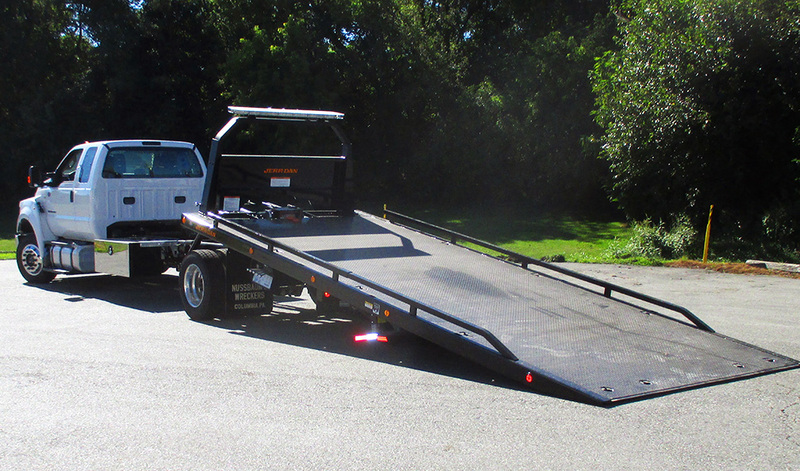 That's why we chose to offer Jerr-Dan's line of towing equipment back in 1980. Today, Nussbaum Equipment continues to be one of the largest Jerr-Dan dealers in the country, still serving our customers' needs and looking forward to new challenges in the future. It's not a cliche to say that a trip to Nussbaum Equipment is like visiting family. "It was their [Jerr-Dan's] reputation that originally interested us," "I also appreciate the company's proactive stance when it comes to their line: they are always improving their products,"
So if you're looking for a Towing Equipment Dealer that takes pride in their work and works with you to find what YOU need, then Nussbaum Equipment is the only name you need to know. For 60 years, our dedication to quality equipment and service has remained unmatched. Put us to the test!